Pioneer Conveyor manufactures a B series idler for 18� through 48� belt widths, the new Pioneer CEMA B design features low roll resistance (< 3 in lb) with a solid 17mm shaft that provides structural integrity that minimizes shaft slope at the bearing location which increases bearing life. Idler rolls are fitted with special 17mm deep groove, high capacity, sealed for life, precision ball bearings. This all means that when you receive a Pioneer CEMA B idler you receive a high efficiency idler with minimal maintenance requirements that is guaranteed to have a long operational life! Seven Gage ASTM 513 Specified Steel Tube with tight tolerance on Ovality, OD and Straightness. Recessed die formed heads continuously welded inside shell ends. Custom Bearing Cavity design to produce idlers with minimal TIR. 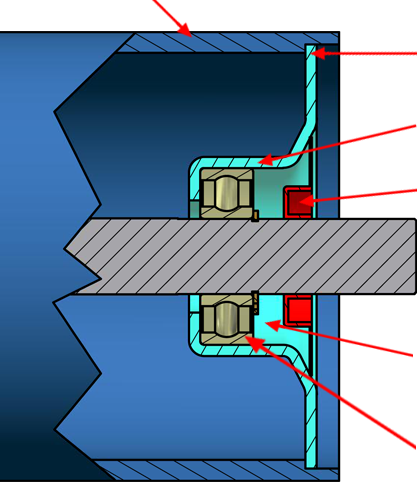 Proprietary 17mm Exterior Seal to prevent contaminants from entering the bearing cavity. Bearing Cavity packed with Lithium Complex NLGI #2 Grease to ensure there is zero oxidation or contamination that would reach the sealed bearing. 17mm Permanently Lubricate/Seal for Life Precision ball bearing. Available in 20º and 35º trough angles. Also available in CEMA C and CEMA D.
Available in 18", 24", 36", 42" and 48" belt widths.